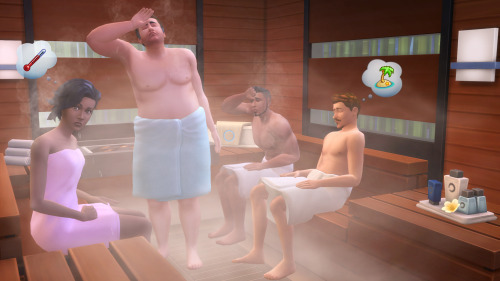 “We’re very excited to announce The Sims™ 4 Spa Day , coming late July! The Sims™ 4 Spa Day provides an all new type of venue, the Spa (duh! ), where your Sims can get a relaxing massage or hang out in the Sauna. This pack features several interactive objects, including a new massage chair and the mud bath! Another new addition to help your Sims wind down from their daily stress is building their Wellness skill by taking Yoga classes or learning to meditate – the higher their Wellness skill the more Yoga poses they will be able to do, and the more superior Massages they’ll be able to give.